Self-guided walking tour in the Tarn Gorges. This self-guided hiking holiday starts in Sainte Enimie, a marvellous small city perched on the Tarn banks. This place is really beloved by the French and is renowned to be an exceptional environment. They come to enjoy one of Europe’s most dramatic scenery, the remoteness of Southern Lozere and escape the crowded trails. The Tarn Gorge is a must-do among the French as mythical as the French Riviera or the Alps Valley. This authentic place is attractive and many French come from all over the country to spend their holiday there. This home-made loop has spectacular parts such as the Tarn and Jonte Gorges, the Causses Méjan, Sauveterre and Causse Noir. 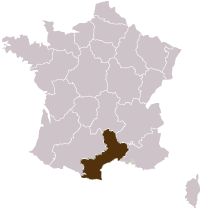 The Causse is the local name given to a limestone plateau at the South of the Central Massif. Charming and preserved villages as Ste Enimie (one of the Most Beautiful Villages of France), La Malène, Vignes, Douzes and Meyruis. Beautiful hamlets as Castelbouc, St Chély du Tarn, Hauterives and Hielzas will be discovered during you trip. You will also cross the entire Causse Méjan. A typical plateau and limestone gorges flora such as orchids, carlines…the vultures reintroduced in the Gorges are part of this exceptional hike. This huge limestone plateau was carved out by the Rivers and dug these impressive Gorges. The life developed very early in this place, witness the numerous prehistoric caves all along the route. Check-in at your hotel. 1st walk along the Gorges of the Tarn roundtrip towards Florac. Do not miss the opportunity to visit one the most beautiful village in France: St Enimie. It is in the very heart of the gorge. A monetary was built in the VI century. It benefited from the aura of the Merovingian queen Enimie. She contracted the meadow disease and was supposedly cured thanks to the water of the Burle spring. We do recommend to walk around the narrow streets, paved with the Tarn pebbles, and discover the ancient houses and little restored squares that give the village a medieval atmosphere. Overnight in Saint Enimie, half board + picnic. 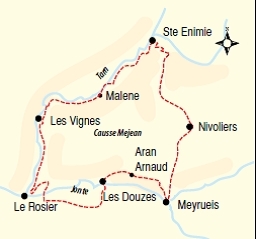 You have two options for the day : 1/ You leave Ste Enimie by the left shore of the Tarn to go down to the vineyards in the heart of the gorges of the Tarn, passing by the corrie of Chély, the castle of Caze, the hamlet of Hauterives, Malène, Detroits and the Pas de Souci, a huge chaos that marks the Tarn under the Roc Aiguille. +410m, -460m. 7h30 walk. 2/ At Malène (Km 14), you can descend the gorges of the Tarn (until the Pas de Souci) in a bark with boatmen (Bateliers de la Malène, 4 to 5 peron in the boat, 21€ per person). You can make the reservation at the hotel. 1h walk to finish (in that case, the total stage is 6h +240m -290m). Overnight in a hotel, half board + picnic in a hotel in Les Vignes. From Mid-April to end of October .